Maryland Governor Larry Hogan announced Thursday he would dispatch 32 state troopers to Baltimore in advance of what is expected to be a large protest Saturday against the police killing of 25-year-old Freddie Gray. Protests have been held daily since Gray died on April 19, seven days after his spinal cord was nearly severed while he was in police custody. 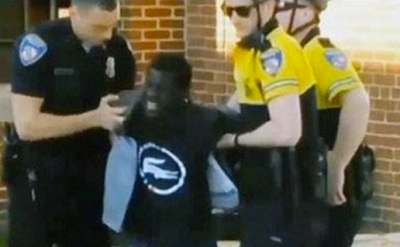 Gray, who was unarmed, was arrested for the “crime” of making eye contact with a Baltimore cop and, according to the police, running away. A bystander video showed a group of police officers loading Gray, who was obviously injured and screaming in pain, into a small steel cage in the back of a police van. Gray repeatedly asked for medical help but the six cops involved in the arrest refused to heed his pleas. Instead, he was driven around town for 30 minutes before paramedics were called. He was taken to a hospital, fell into a coma and died a week later. On Thursday, it emerged that the cops, who have been suspended with pay, failed to secure Gray with a seat belt, a violation of the police department’s policy. That policy was put into effect after another arrested man, Dondi Johnson, died of a fractured spine in 2005 after he was arrested and transported without a seat belt while his hands were cuffed behind his back. The “rough ride” given Gray likely compounded whatever injuries the police had previously inflicted on him. The response of Mayor Stephanie Rawlings-Blake, a Democrat and African American, has been to feign sympathy for the devastated family of the victim, promise a quick and thorough investigation, and urge demonstrators to remain peaceful. At the same time, repression against demonstrators has increased, with two people taken into custody on Thursday. Now the governor, a Republican, is sending state troopers to Baltimore in what could be the first step in a larger mobilization of state forces. With the protests growing in size and moving from the local police precinct to City Hall and the US Courthouse in downtown Baltimore, Democratic officials are beginning to raise the red herring of “outside agitators” to divert attention from the murderous actions of the police and the longstanding cover-up by local and state politicians. Bernard Young, Baltimore City Council president, said on Thursday that he hoped residents would not let “outside forces come in here and dictate how we act by destroying our infrastructure.” Young speaks for the largely African American Democratic Party establishment in Baltimore that has for many years presided over the deindustrialization of the city and impoverishment of its working class inhabitants, black as well as white, and enrichment of a narrow African American elite. Last month, Baltimore residents protested the city’s decision to begin shutting off water service to households that are behind on their water bills. The city’s Department of Public Works announced it would begin cutting off water to as many as 25,000 people. According to a web site that tracks police killings in the US from media reports, 368 people have died so far this year at the hands of cops.